One of my favourite pastimes is eating out at vegetarian & vegan establishments whenever I come across them on my travels. Yesterday, I was lucky enough to spend the day in beautiful Bath, with some of my best friends. Carla and I decided to have lunch at The Green Rocket Cafe, on Pierrepoint Street. I’d passed it before and stopped for a sandwich, but on this occasion we decided to have a proper lunch – and weren’t disappointed. My mezze platter featured wonderful baba ganoush and beetroot dips, quinoa tabouleh, falafel, soft flat bread and a wonderfully dressed spiral carrot salad. 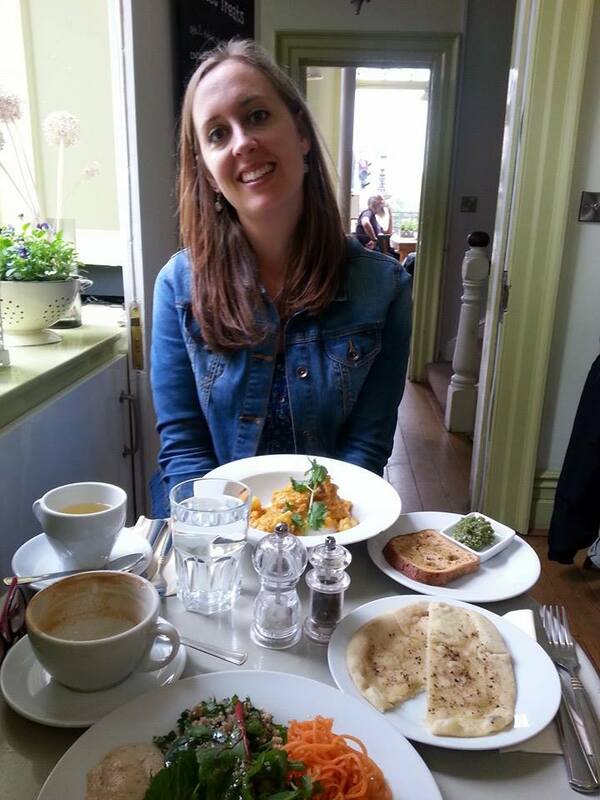 Carla enjoyed a super roasted cauliflower dahl, with the most incredible homemade pesto on the side! I only wished we’d had time to sample some of the homemade vegan cakes they had on offer. Really friendly staff, great setting and mouth-watering food. Definitely worth a visit if you are in the historic city (a trip to Bath Spa is also highly recommended). My latest triumphant find is Roots Cafe, in my once hometown of Taunton in Somerset. My best friend had told me they had an impressive selection of vegan dishes, alongside a meat-dairy based menu. Seeing was believing. Congratulations to them for producing one of the most imaginative vegan menus I have seen outside a 100% veggie venue. Grilled Tomatoes, Baked Beans, Toast & Vegan Butter. This was followed by vegan Australian Crunch! Roots serve hot drinks made with all different kinds of plant milk, as well as soya, to be enjoyed with a host of cakes and sweet treats, which are also vegan. If only some of the other cafes I have visited would take a leaf out of Roots’ book! Even though many where I live serve soya milk, some don’t and most of the time, the only thing I can eat is a flapjack! It would be lovely to be able to go out to lunch and choose a sandwich like those offered by Roots. So Swansea and South Wales, please take note! One great exception is the D-Lish Cafe on the Kingsway, which does have several good vegan options and is very welcoming. Viva! have just published their new Catering Guide, which is free to download. It offers recipes and tons of information about how to cater for veggies and vegans. I was even lucky enough to shoot the photographs.